The WWOOF-USA Small Farm Grant Program, established in 2013, awards grants to WWOOF-USA hosts for special projects that help to further WWOOF-USA’s mission, enhance the educational experience of visiting WWOOFers on farms, and promote small-scale organic agriculture and land stewardship. WWOOF USA received many outstanding proposals this year and want to thank all hosts for the hard work and effort that was put into the proposals. Build a multipurpose solar complex containing two solar-heated showers, a solar-heated commercial-grade washing station, and a rainwater catchment system. This certified organic and Global GAP-certified farm in Florida has hosted more than 250 WWOOFers from 26 countries. The grant will help them to become off- grid and more fully sustainable, while maintaining the high standards needed for GAP certification of their blueberries. Construct a mobile coop for pastured laying hens to allow them to rotationally graze 100 hens. Project goals include improving soil fertility and adding a new high-quality egg enterprise to the farm. This project will introduce new learning opportunities to WWOOFers about managing a diversified family farm, while building soil health, and providing nutritious eggs to WWOOFers and the community. Make an edible landscape garden and a community gathering space for the ‘WWOOFer house’. This project was proposed by WWOOFers, for WWOOFers, and will be built and managed by them. First Generation Farmers is a recently established nonprofit farm. They have been WWOOF hosts for 3 years, and in that time, have hosted more than 150 WWOOFers. They are committed to making fresh, healthy food accessible to everyone, and offer their produce at up to 8 farmers’ markets per week on a donation basis of “take what you need, donate what you can”. Upgrade the rainwater collection system and the power supply to their production area. Flagstaff EcoRanch is a registered nonprofit and education center focusing on sustainable living and agriculture. This project will increase their capacity to provide educational opportunities for WWOOFers, students, and community members in the high desert of the Southwest. Build two modern Conestoga Wagon micro-houses to provide year-round shelter for WWOOFers at this 30-acre certified organic and vegan farm in Oregon. The Conestoga Hut uses minimal materials, is simple to build, economical, and provides durable shelter. Hand drill a well, build two micro-cabins for WWOOFers using reclaimed and salvaged materials, and plant over 70 food bearing perennials. These projects will allow Hidden Grove to comfortably accommodate more long term WWOOFers at this family-run farm. Build an underground house, with a slope shed roof, running water, heat, solar electric, sleeping areas, and a kitchen. This new home will provide a living space for the host, a gathering space for community, and a room for WWOOFers year-round, and help this Montana host rebuild after a devastating recent fire. Create a multi-use WWOOFer kitchen, dining room, computer use area, and reading room. These hosts became interested in sustainable farming in 2007 as WWOOFers in France. 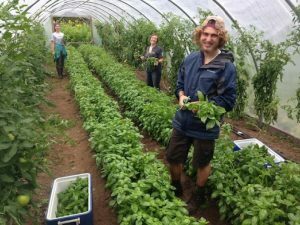 The experience inspired them to become farmers and WWOOF hosts in turn. Today they have hosted more than 150 WWOOFers from around the world over the course of 10 years, at their 30-acre organic farm in the Capay Valley in California. Install an underground root cellar at this off-grid farm, and allow for the storage of harvested crops without refrigeration. Rather than connect to the electric company or attempt to build an off-grid version of the modern solutions, this project will employ an age-old method used by traditional agriculturalists – using the stable temperatures and moisture of the earth to keep food fresher for longer. These hosts live and work full time on their farm from March through November with the help of WWOOFers, and when their farm freezes, they WWOOF throughout the southern United States on other organic farms, learning new approaches & networking with likeminded people. Construct a composting toilet and upgrade housing facilities on this diversified, off-grid homestead in Minnesota. Before settling in Finland, Minnesota, these hosts worked and studies at farms across the USA, as well as in Switzerland, Holland, India, and Sri Lanka. In addition to Round River Farm, today they co-manage the nearby Wolf Ridge Organic School Farm and David directs the OCA AgroEcology Center, both of which are also listed with WWOOF-USA. Renovate an existing building and construct a small addition containing a shower and sink, in order to create a low-tech, eco-friendly toilet and shower system for WWOOFers and farm visitors. This project will further the farms responsible stewardship of their land, and serve as an educational opportunity for WWOOFers. Increase the teaching apiary by adding additional hives. Taos Goji teaches basic workshops to WWOOFers on beekeeping, in addition to growing goji trees. 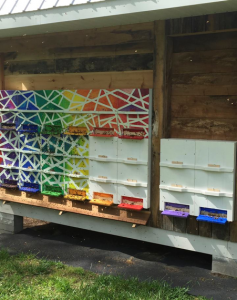 Last year their bees were devastated by bears, so this project will help build up the hives again while providing bees for the farm and for teaching beekeeping basics to WWOOFers. Build a Slovenian-style beekeeping shelter, which combines a protected bank of built-in beehives with a multiple-use interior space for hive management, honey processing, and WWOOFer housing. Additionally, a sheltered extension will contain an outhouse and three-season shower facility. The building will ease pressure on the host’s home plumbing, give them greater control over water use, especially in drought conditions, increase the quality and quantity of housing they can offer WWOOFers, and provide for expansion of their beekeeping/pollinator conservation program. WWOOF USa invites you to stay tuned in January 2018 for information on how to apply for the grants program again next year.